덴마크 사람은 운동을 무척 좋아한다. 덴마크에서 우리는 운동과 우정을 양분하지 않는다. 둘 다 좇는다. 그렇다고 우리가 학업이나 일을 소홀히 여긴다고 오해하지는 말아라. 덴마크인에게 학업과 일만큼 사회 생활도 중요하다는 뜻이다. 덴마크에는 운동조합(sports unions)가 많다. 그 중 대다수는 백화점 같다. 운동조합 안에서 좋아하는 종목을 고르기만 하면 된다. 장보듯 여러 종목을 고를 수도 있다. 어린 아이대신 부모가 종목을 골라주기도 한다. 백화점에서 쇼핑하듯 말이다. 몇몇 사람은 종목을 고른 뒤 평생 같은 운동조합에서 같은 종목에 매진하기도 한다. 운동조합에서 사람을 사귀기 좋은 이유다. 심지어 온가족이 같은 운동조합에 다니는 경우도 있다. 증조부부터 증손자까지. 12세 줄리(Julie)도 그런 아이다. 증조부와 증조모가 같은 운동조합에 다니기 시작한 뒤 자녀를 데리고 갔다. 지금은 증손자가 함께 한다. 지금 뱃속에 아이가 있다면, 이 아이가 세상에 나온 뒤 도전할 만한 일 아닐까. 2016년 4월9일 리쇠 운동조합(Rishøj I.f. )이 체조(gymnastic) 공연 시즌을 마감하는 연례 발표회를 열었다. 이날은 가족친지가 함께 와 가족이나 친구가 1년 동안 연마한 실력을 본다. 운동조합이 특별한 이유는 운동에 접근하는 독특한 철학 때문이다. ‘즐기자’는 거다. 대다수 운동조합에서 훈련사(trainer)는 무보수로 일한다. 훈련사 일은 두 번째 가족을 만나거 취미활동을 하는 셈이다. 새 친구를 사귀기 좋은 환경이다. 운동조합에서는 나이가 몇 살이든 언제나 환영받는다. 모든 사람을 위한 강좌가 있다. 부모와 아이가 함께 하는 체조와 성인 용수철 체조도 있다. 참가자는 각자 다른 배경에도 불구하고 힘을 모아 훌륭한 결과물을 내놓는다는 점을 가장 자랑스러워한다. 훈련사뿐 아니라 모든 운동조합원한테서 이런 모습이 보인다. 얼마나 어리든 얼마나 나이 들었든 상관 없다. 누구에게나 한 가지만은 약속할 수 있다. 운동조합 활동이 즐겁고 무척 사회적이라는 사실 말이다. 13세 마틸데와 52세 캐스린은 다른 사람에게도 운동조합 활동을 권할만 하다는데 절대적으로 동의했다. 한국인 관점으로 운동이라는 취미는 어떤가. 잘 모른다면 덴마크 사람도 한국인처럼 운동을 잘 하려고 노력한다고 생각할지 모르겠다. 가족과 같은 취미를 가지면 좋다. 진짜 가족이든 아니든 괜찮다. 덴마크인은 실수하더라도 즐긴다. 신경 안 쓴다. 단지 즐기고 싶어할 뿐이다. 운동은 더 행복하고 건강해지는 한 가지 방법이다. 덴마크인은 운동조합 활동을 취미로 여기지만 마지막 발표회에는 기꺼이 돈을 내고 보러 간다. 놀랍다. 아는 사람 공연만 보고 자리를 뜨지도 않는다. 행사가 모두 끝날 때까지 자리를 지킨다. 하지만 영원한 것은 없다. 20시즌 동안 발표회를 뒤로하고 한 사람은 오늘 마지막으로 무대에 올랐다. 52세 얀이다. 운동조합에서 활동한 20년 동안 그의 자녀가 같은 운동조합에서 자라고 떠났다. 그는 조합에 가입하고 몇 년 뒤부터 훈련사로 활동했다. 조합에서 그는 친구를 만들고 많은 즐거움을 누렸다. 하지만 그는 깨달았다. 그의 몸은 운동조합 활동을 계속할 수 없었다. 그는 지난 모든 세월과 그동안 누린 즐거움에 감사하지만 이제 떠날 때라고 말했다. Sport or friendship ? – I choose both of them! The Danish people love to be active. In Denmark, we don’t have to choose between sports or friendships. We want both of them. Don’t misunderstand me we do take our studies and work seriously. However, it’s just as important to us to have a social life outside of studies and work. You will find a lot of different sports unions in Denmark. Most of them are like a department store. You just pick which sport you want in that union. It can be one or several like when you go shopping. ?Just like the department store you don’t pick one when you are a kid. Your parents pick it for you. However you do pick the sport, some people just stick with the same union or sport their whole life. And that’s because of the people you meet in the unions. Sometimes you will even find that a whole family is in the same union. From grandparents to grandchildren. Julie 12 years is one of those children. Her grandparents started in the union and brought in their children and now the grandchildren. This proof that if you still have that inner child there’s a place where you can get it out and still be challenged. on April 9 2016 Rishøj I.f. had their annual end of the season performance for gymnastic. This is a day where family and friends come together to see someone they know and how they have developed doing the year. One thing that’s very special about this union is the theme for their work. – Let’s have fun. The trainers don’t do this work for the money (in most unions). For them, it’s like a second family and a hobby. It’s a place where you meet new friends. I realised it’s easier to make friends in different environments because you have the same interest. – 최빛나(23) first time to see this. It’s a place where you can come no matter how old you are you will always be welcome. There is a class for everybody. 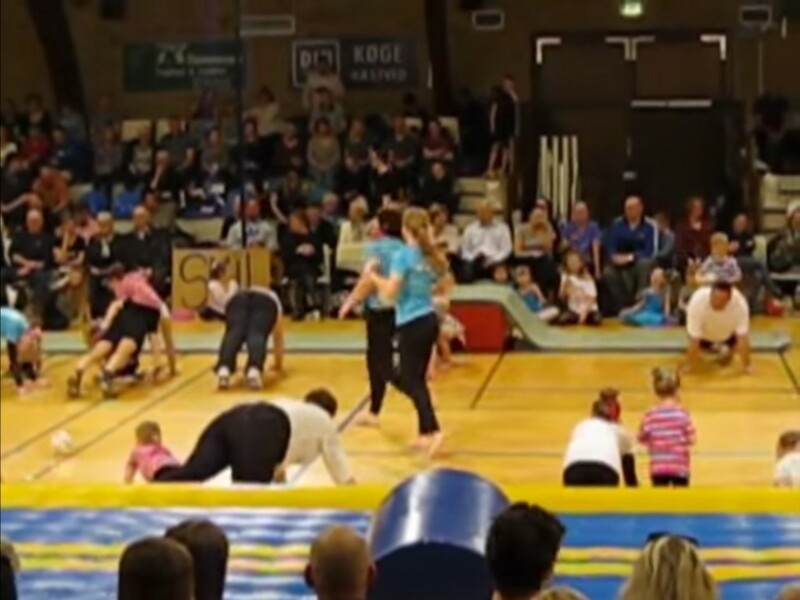 everything from mom, dad and child gymnastic to adult spring gymnastic. One of the things that they are very proud of is that despite the different backgrounds they can work together to make something good. “The trainers are very engaged and committed” (Karin, the foreman of Rishøj IF). This is also something that you can see on everybody who is a part of this. it doesn´t matter if you are old or young one thing is for sure it’s fun and it’s very social. Mathilde 13 years and Kathrine 52 years definitely agree that this is something that they would recommend to other people. Sport as hobbies?from a Korean person’s view. When you don’t know about it you would think it’s the same as in Korea – wanting to become a professional. It’s nice to see that you can have a hobby together with your *family* real or not. The Danish people are enjoying it even if they make mistakes. They the don’t care they just wanna have fun. That’s one way to become happier and more healthy. Some of the biggest surprises is that the Danish people just treat it as a hobby and for this last performance people actually don’t mind paying money to go see it. Also they don’t stay just to see the person they know. They stay for the whole show. However nothing lasts forever and for one man this was his last performance after 20 seasons. Doing these 20 years he has seen his children grow in the union and also leave again. He started as a trainer after only a few years after joining the union. He found friends and had a lot of fun. But now he has come to the conclusion that his body can’t do it anymore.